Schedule-Cloud is a cloud-based, interactive employee scheduling tool for catering and special events in major facilities or off-site. Featuring mobile time clock and payroll, real-time scheduling and reporting, plus a biometric time clock, Schedule-Cloud aims to deliver a comprehensive scheduling solution. Overall Schedule Cloud is an easy to use, efficient platform, but I do see room for improvement. Good layout and easy access to the features I primarily use. Time Clock. Event replication saves a ton of time. I would like there to be a feature that automatically tracks the acceptance rate of staff. We require them to accept at least 50% of the shifts offered to them, but in order to track this, we have to generate a report for a given staff member and individually count the total number of shifts they were offered and how many they accepted versus decline/allowed to expire. This is time consuming, and also allows people who need to be spoken to about a low acceptance rate to slip through the cracks. If there was a way for us to see the percentage right next to the person's name when we were in the shift offer screen, similar to how we can see their hours, I think this would be a massive improvement. It would also be great if Time Clock would automaticall notify admins if someone was punched in late, similar to the emails that come when someone is recorded as a No Show. This would allow for much easier tracking of lateness. Thank you for your response. We can easily send an email to the booking person if someone clocks in late. Not all booking people want this feature. We will discuss with the companies senior management. As for the % of declines for each person this report can also be provided. We provide reports based on each companies preference. When users have requests for specific reports they should go through their senior management and when approved we will generate the report for that company. 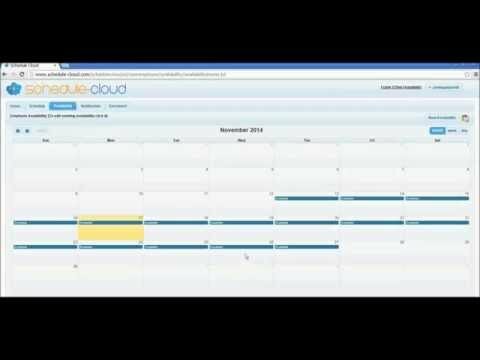 Schedule Cloud was built for our business and we couldn't do the job without it! Software is our enterprise solution that supports both our staffing and our payroll / time and attendance requirements.Schedule Cloud is fairly easy to use. The Time and Attendance system is invaluable and we just couldn't run our business without it. Schedule Cloud is fairly easy to use. The Time and Attendance system is invaluable and we just couldn't run our business without it. It would be nice to see that Schedule Cloud would upgrade the overall system with the latest technology. I've seen newer systems in the market that run faster and have much more bells and whistles from an "app" perspective. Also as we grow the overall system seems to slow down. Tied our scheduling timeclick and payroll in one simple to use application. It has made my life easy. It changed how we do business and made our lives easier. It is intuitive with a number of features we needed in our schedule program. It changed how we do business and made our lives easier. It is intuitive with a number of features we needed in our schedule program. Ability to have our weekly schedules using bio clocks and SC Application for Event clock in/out streamline into payroll. The bio clock feature is somewhat inconsistent with connectivity to the source of schedules causing the bio clock not to be used during several weeks this past year. The ease of the ease complete Staffing process. The functionality of the program as a whole, and the ability to work with other team members efficiently. That not all features needed are included in what we require to execute our entire job of the Staffing process. Contact Schedule-Cloud directly for detailed pricing information. Supports custom scheduling and management reports. Allows supervisors to sign-in employees at events with the mobile time clock. Records employee times, then sends this information to payroll. Facilitates secure employee time tracking with the biometric time clock. Below are some frequently asked questions for Schedule-Cloud. Q. What type of pricing plans does Schedule-Cloud offer? Q. Who are the typical users of Schedule-Cloud? Q. What languages does Schedule-Cloud support? Q. Does Schedule-Cloud support mobile devices? Q. Does Schedule-Cloud offer an API? Yes, Schedule-Cloud has an API available for use. Q. What other apps does Schedule-Cloud integrate with? Q. What level of support does Schedule-Cloud offer?